This exhibition is part of the program of the yearly Kinderrechtenweek in Leiden, which is dedicated to the International Day of the Child on the 20 of November. More than 108 000 Palestinians have lost their homes during the 2014 summer Israeli military offensive in the summer of 2014 in the Gaza Strip. 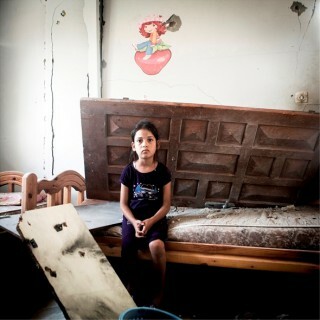 The majority of Palestinians displaced are children. Their room, which was supposed to be their safe place, their little universe, was destroyed in seconds. A simple question was asked by the photographer Anne Paq to each child: What do you miss the most from your room? More than one year after the end of the Israeli military offensive in Gaza, these photos are still shockingly relevant. Almost no home, which had been completely destroyed, has been rebuilt, and thousands of Palestinians are still living in makeshift shelters. If the homes one day might be rebuilt; but what about the trauma of these children who grew up in fear from further bombings ? Anne Paq is a French freelance photographer and videographer who lived many years in Palestine. She is a member of Activestills, a group of committed photographers, based in Palestine / Israel. Since 2010, she has devoted much of her work more on my Gaza. In 2014, she documented the Israeli offensive “Protective edge” and its aftermath. The Activestills Collective is born out of the Palestinian popular resistance in Bil’in, a small Palestinian village that has demonstrated for years every week against the building of the Wall on their land. The group sees itself as fighting against all forms of oppression and seeks to reach the public directly by organizing street exhibitions in several Israeli cities and internationally. Activestills includes Israeli, Palestinian and international members. In ten years, the group has become a reference as an alternative source of images and information on political and social issues in Israel/Palestine. In 2015, Activestills celebrates its tenth anniversary. More than 30 000 photos are available on the collective website. The exhibition is organized by Leiden municipality, DCI and the Dutch coalition for Palestinian children in Israeli detention of which gate48 is a member.